The second of the 3 ‘Rs’ is Reuse. ZWV is exploring the feasibility and benefits of processing Vashon’s organic waste streams into a sustainable resource through partnership with King County Solid Waste and the community. Many items that go into the garbage or landfill are actually great resources. They can be turned into valuable sources of energy, fertilizers and soil amendments. Gardeners and farmers are familiar with composting which reuses plant and manure wastes to create a valuable soil amendment. 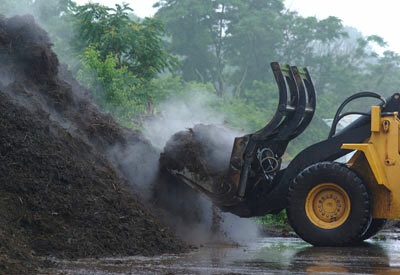 This is called aerobic composting. It uses bacteria that work in the presence of air to break down the plant material. Some items are not ideal for aerobic digestion. They may break down quicker and with less odor by using bacteria that work in the absence of air instead. This is called anaerobic digestion. A benefit of anaerobic digestion is that it occurs in a sealed vessel which allows gases to be captured. The primary gas is methane which can be used as a fuel for generators, heating or even vehicles. ZWV is working with Impact BioEnergy on a test project that will convert okara (tofu waste) into energy and fertilizer. This project is expected to start operation around October 2018. Another form of anaerobic digestion happens in the guts of animals. Worm castings are a fantastic garden resource that start with the bacteria in the guts of red wiggler worms. Wood waste is another abundant resource on island. Currently this is shipped off island, but with a little work it can be chipped, baked at high temperature and turned into biochar, another wonderful soil amendment that ZWV has been testing in it’s Waste to Garden project behind the IGA and Granny’s Attic. Biochar has been used since ancient time to enhance the fertility of soils. And speaking of Granny’s Attic, this is a great way to give a second life to something you no longer need. Donating used items to Goodwill, Granny’s, local churches, the library, etc. is a great way to reuse useful items.